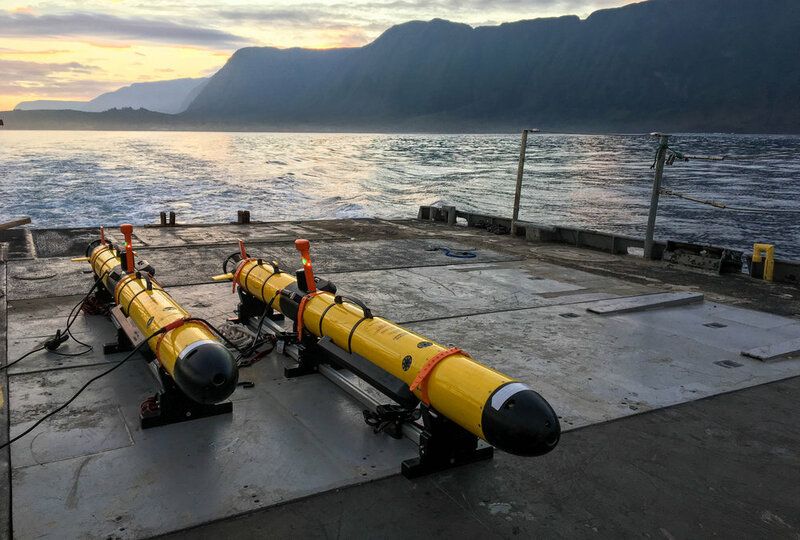 Orca Maritime took two Iver 3 AUVs to Hawaii for a 5 day survey project. 10 square kilometers were mapped using side scan sonar, including a 20 meter tall steeply sloped face. Using public data along with sonar and imagery collected by Orca Maritime, we are developing a base environmental GIS to highlight the use of cutting edge data collection and mapping technology in environmental monitoring. Surveys of three marinas and their approaches from the main channel were conducted using an Iver3 AUV. Each area was surveyed at night to deconflict with both pleasure and commercial vessel traffic. The surveys provided the client with imagery and depth values on three possible locations for passage and berthing of a deep draft vessel. The side scan and bathymetric sonar were collected by the AUV at the same time during each mission, providing co-registered data and efficiency. Orca Maritime Inc. was invited to speak at the Esri Headquarters during the 2017 Esri Ocean GIS Forum in Redlands, CA. The Esri Ocean GIS Forum is the world's largest GIS conference focused on ocean applications. During the final technical session, Geospatial Tech Lead Nate Novak presented recent work entitled “Mapping Underwater Explosive Remnants of War (ERW) using AUV-mounted Sensors, ROV videos and ArcGIS in a Complex Seabed Environment”. The use of Autonomous Underwater Vehicles (AUVs), Remotely Operated Vehicles (ROVs) and Esri ArcGIS have improved project tracking and management efficiencies. After a recent AUV survey, Esri ArcGIS tools were used to geospatially consolidate magnetic signatures, side scan sonar imagery, bathymetry, video and spatially referenced diagrams, providing an accurate underwater map of the UXO field. Orca Maritime Inc. is part of the Esri Business Partner Network and is an active member of the Esri Seaport-enhanced team. Side scan and bathymetric surveys of the Marine Group Boat Works yards were completed by Orca Maritime using an Iver3 AUV equipped with an EdgeTech 2205 sonar. Marine Group Boat Works is a full service boat and superyacht refit and repair facility with two locations on the San Diego Bay. The survey was conducted with boats tied to the docks and no interruption to regular business for either boatyard. The complete survey of the National City location was conducted with 2.5 hours of track lines and Chula Vista with 1.5 hours of track lines. Each site presented a complex area with infrastructure and boats hulls to survey around and under. The AUV, equipped with an INS essential for underwater nav accuracy in tight quarters, was able to run at depths optimal for the range and frequency needed to maximize coverage and data resolution. Orca Maritime freed a REMUS 600 caught on an abandoned line 24m from the surface using a Seabotix vLBV300. Orca was at sea performing ROV inspections on bottom contacts when the team was asked over the radio by the UUV operators if they could lend a hand. Despite a strong current in the area causing difficult conditions for ROV operation, great visibility and a good position on the UUV helped get the ROV on target quickly. NASA's Jet Propulsion Laboratory acquired an Iver3 AUV and came to the facilities at Orca Maritime for three days of training by Ocean Server and Orca personnel. The AUV will be used to test autonomy developed at JPL for adaptive route planning, hazard avoidance and navigation. Orca Maritime used an Iver3 AUV equipped with an EdgeTech 2205 sonar to conduct a survey off the coast of San Clemente Island, CA. The survey covered .25 square kilometers with seven separate missions programmed to meet different requirements, including low and high frequency sonar and bathymetry. Kelp in the near shore of the survey area was the cause of four missions ending before all track lines were complete. The survey team used Orca's Seabotix vLBV 300 to free the AUV so that it could be set back on mission and complete the survey. For the second year in a row, Nate Novak of Orca Maritime, Inc. was a designated speaker at Esri Headquarters during the 2016 Esri Ocean GIS Forum in Redlands, CA. The Esri Ocean GIS Forum is an international conference for professional scientists, engineers, and technologists within the ocean GIS community. As the final presenter in the Applied Marine GIS session, Novak provided a streamlined discussion of “Autonomous Underwater Vehicle (AUV) Data Processing Workflows”. During the presentation, he introduced topics such as mission planning, hardware components and capabilities of the OceanServer IVER3, Post-Mission Analysis (PMA), imagery processing, navigational corrections, and enterprise geodatabase mosaic dataset management. The audience was given a sneak peak at how Orca processes thousands of environmental samples collected by an AUV at depth, as well as interpolation methods used to produce rasters within ArcGIS Pro. A case study showed that instead of recording mission information with notebooks, clipboards, and maps, Orca Maritime uses web- and mobile-based GIS apps on ruggedized tablets to reduce human error, and produce a quick turnaround of time-sensitive data. GIS experts at Orca Maritime integrate the best of government and industry capabilities into long-term solutions for a wide range of clients. Orca Maritime is an active member of the Esri Partner Network and the Esri Federal Small Business Specialty. Orca Maritime, supporting Hydronalix, demonstrated an autonomous Mobile Gateway Buoy (MGB) as part of the Office of Naval Research (ONR) exhibit at National Harbor during the 2016 Sea-Air-Space Exposition. Sea-Air-Space is hosted by the Navy League of the United States with the goal of bringing together leaders from defense organizations, both government and private industry, to learn about and view the most up-to-date information and technology related to maritime policy. Orca Maritime’s GIS team traveled to Esri Headquarters in Redlands, CA for the 2015 Oceans GIS Forum. While there they presented a Lightning Talk on advanced techniques of using ArcGIS for identifying and mapping Explosive Remnants of War (ERW). As a leader in underwater site management, the team offered solutions in building geospatial infrastructure relating to the scalable collection, processing, storage, and effective display and analysis of underwater infrastructure and resources. The tools and technologies applied were customized using highly specialized commercial off-the-shelf products and extensions. Orca Maritime’s GIS subject matter experts, Martha Rodgers and Nate Novak, displayed innovative applications and discussed a multitude of future integrations with the Esri ArcGIS platform. Orca Maritime is part of the Esri Partner Network. Please visit our partner website to learn more about Orca Maritime and the Esri Partner Network. Orca hosts data processing seminar at their office in Imperial Beach, CA. The seminar explored the advanced capabilities of Oceanic Imaging Consultants' (OIC) Cleansweep3 processing software. Software, sonar, and autonomous underwater vehicle (AUV) engineers from OIC, L3-Klien, and OceanServer Technology were in attendance as well as Orca's subject matter experts in unmanned undersea operations and geographic information systems (GIS). Discussions included advanced processing optimization of side scan and bathymetric sonar, and magnetic imaging data gathered from sensors on an AUV. Orca's ops team images the USS Hogan, a Wickes/Clemson class destroyer built in 1919. While in service she saw extensive combat action in the Atlantic and Pacific theaters during WWII including fighting off Kamikazes at Lingayen Gulf in the Philippines. She finished her war time career bombarding Iwo Jima. She was sunk in 1945, during naval gunnery and bombing tests near San Diego. The wreck lies in 125 feet of water. While returning from finished ROV work, Orca was able to respond to a nearby fouled Navy REMUS 600. The vehicle was tangled at 90' on a previously cut line that was still anchored to the bottom. Using both the grabber and cutter attachment on the ROV, the team was able to free the AUV and recover the line from the ocean . With nine years of business in San Diego, Orca Maritime was profiled by the San Diego business journal. You can read the article in the papers 4th quarter July edition. Orca Maritime conducted a pipeline inspection covering over 10,000 ft. of the Veolia Wastewater Treatment outfall near the U.S./Mexican border. A vLBV300 with scanning sonar and HD video recording was used to search for and document any deterioration within the 6' diameter pipe. Orca Maritime responded to calls for support at the Refugio Oil Spill on the Gaviota Coast in Santa Barbara, CA. Using the vLBV300 ROV to inspect low lying areas of the seafloor for submerged oil. Contracted by Plains All American Pipeline, a pair of operators conducted the day-long survey with RPI, a science technology firm that provides environmental assessments of spill emergencies. Orca Maritime performed a week long demonstration for SCORE at Pyramid Cove, San Clemente Island. Using two AUVs and an ROV, Orca demonstrated their ability to locate targets using sonar and then identify them with the ROV while on site. Sonar, bathymetric and magnetometer data was collected, processed and inserted into a GIS database with HD video from the ROV. Orca Maritime gains contract under Hydronalix to test and assist in the training and implementation of their USV (Unmanned Surface Vehicle) platforms. Using a design based off of the E.M.I.L.Y, the USV can be fitted for multiple sensors and pay loads for survey and ISR missions.